The Australian Cattle Dog is an extremely intelligent, active, and sturdy dog breed. Developed by Australian settlers to handle herds of cattle on expansive ranches, he’s still used today as a herding dog. He thrives on having a job to do and on being part of all family activities. He is loyal and protective of his family, though wary of outsiders. Besides herding work, the Australian Cattle dog does well at canine sports, including agility, obedience, rally, flyball, and flying disc competitions. See below for complete list of Australian Cattle Dog characteristics! You might be familiar with this breed by one of his other common names: Australian Heeler, Blue Heeler, Queensland Heeler, or Halls Heeler. Officially, however, he's the Australian Cattle Dog; the "heeler" moniker comes from the fact that the dogs were bred to herd cattle by nipping at their heels. The Australian Cattle Dog is a high-energy working dog. He is not a couch potato — we repeat: he is not a couch potato. He wants to be active and busy most of the time. His energy must be directed, or he'll become bored and will resort to entertaining himself, usually by doing something you consider naughty, like digging in the trash or digging up your flower garden. The Australian Cattle Dog is also highly devoted to his owner and family. He usually attaches himself closely to one person and bonds less closely with others. He's often called a "Velcro" dog because he attaches so firmly; he likes to be in close physical contact with his chosen person all the time. Because the Australian Cattle Dog was bred to herd, and herd with force, by biting, he is a mouthy dog. His instinct is to nip cattle, children, pets, cars, anything that moves. He has a strong tendency to bite, even in play. This tendency must be properly directed with socialization and training when he's a puppy, or it can turn into dangerous behavior. Another part of the breed's instinct is his strong prey drive. He's fascinated by squirrels, cats, and other small animals. If the Australian Cattle Dog is raised from puppyhood with other pets, including cats, he can be trusted to live peacefully with them in his home. He's likely to consider those outside his household to be fair game, though. The Australian Cattle Dog is generally friendly, but he is protective of his family and home turf, and he tends to be wary of strangers. There is a toughness about the Australian Cattle Dog — he had to be tough to handle the high temperatures, rough terrain, and long distances involved in his job on ranches — that makes him both highly tolerant of pain and intensely focused. He'll keep working even when he's injured. Owners must pay careful attention to this breed to make sure he stops working or competing if he gets hurt. The Australian Cattle Dog was bred by 19th-century Australian settlers to herd cattle on large ranches. This breed was instrumental in helping ranchers expand the Australian beef industry by quietly but aggressively herding the sometimes uncontrollable, almost wild cattle with nips and bites. Today's Australian Cattle Dog is the result of many breedings and cross-breedings. Ranchers sought a hardy dog who could handle the harsh climate and working conditions in Australia. Dogs initially brought from England weren't up to the job, so they were bred to the native Dingo. Countless breedings by many different ranchers finally resulted in what's believed to be the ancestors of the present-day Australian Cattle Dog. Blue-colored dogs proved to be the most popular among ranch owners and drovers, and they became known as Blue Heelers. 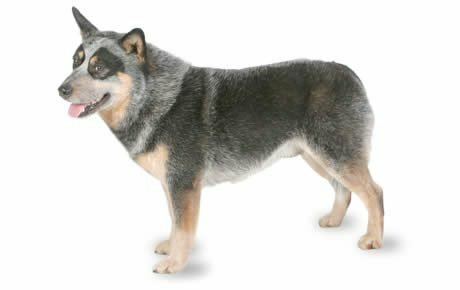 They were especially popular in cattle runs in Queensland, where they were given the name Queensland Heelers or Queensland Blue Heelers. In 1893, Robert Kaleski took up breeding Blue Heelers, and he started showing them in 1897. Kaleski drew up a standard, basing the Cattle Dog on the Dingo, believing that this was the type naturally suited to the Australian outback. (Today's Australian Cattle Dog does look much like the Dingo, except for color.) The Kennel Club of New South Wales approved this standard in 1903. The breed was first known as the Australian Heeler, then later as the Australian Cattle Dog, which is the name now accepted as official throughout Australia and elsewhere. However, some people still call them Blue Heelers or Queensland Heelers. After a period in the Miscellaneous Class, the Australian Cattle Dog was accepted for registration by the American Kennel Club May 1980. He became eligible for show in the Working Group as of September 1980. The breed was transferred to the Herding Group in January 1983. Males stand 18 to 20 inches tall, and females stand 17 to 19 inches tall. Weight ranges from 30 to 50 pounds. The Australian Cattle Dog is an extremely active dog who needs constant mental and physical activity. If he's bored or lonely, he can be destructive. He's apt to chew and tear up items he shouldn't. If you choose to live with an Australian Cattle Dog, be prepared to keep him busy — and tired. If he's tired, he's less likely to get himself into trouble. The Australian Cattle Dog is protective of what he considers his territory, and he'll defend it. He's also reserved (not necessarily unfriendly) with strangers. But he's devoted to his owner and family. Once he bonds, he likes to go wherever his owner goes; in fact, punishment to the Australian Cattle Dog is physical separation from those he loves. He's smart, but at times he can be willful and stubborn. Consistent, positive training helps control his independent streak. Like every dog, the Australian Cattle Dog needs early socialization — exposure to many different people, sights, sounds, and experiences — when they're young. Socialization helps ensure that your Australian Cattle Dog puppy grows up to be a well-rounded dog. Enrolling him in a puppy kindergarten class is a great start. Inviting visitors over regularly, and taking him to busy parks, stores that allow dogs, and on leisurely strolls to meet neighbors will also help him polish his social skills. Australian Cattle Dogs are generally healthy, but like all breeds, they're prone to certain health conditions. Not all Australian Cattle Dogs will get any or all of these diseases, but it's important to be aware of them if you're considering this breed. If you're buying a puppy, find a good breeder who will show you health clearances for both your puppy's parents. Health clearances prove that a dog has been tested for and cleared of a particular condition. In Australian Cattle Dogs, you should expect to see health clearances from the Orthopedic Foundation for Animals (OFA) for hip dysplasia (with a score of fair or better), elbow dysplasia, hypothyroidism, and von Willebrand's disease; from Auburn University for thrombopathia; and from the Canine Eye Registry Foundation (CERF) certifying that eyes are normal. You can confirm health clearances by checking the OFA web site (offa.org). Deafness: This is an inherited condition in the Australian Cattle Dog, but it can be tested for while the puppies are very young. Deaf dogs should not be bred. Research indicates that deafness is color-linked; genes that cause pups to be born white, or with white hairs in the coat that cause a roaning pattern, are linked to deafness. Brainstem auditory evoked response (BAER) testing is useful for determining hearing problems, but it's only a tool, not a cure. The hardworking Australian Cattle dog is best suited to an environment where he gets plenty of physical and mental stimulation. He's not well suited to living in an apartment or being left alone for long periods of time. He's destructive when bored, and he tends to chew — a lot. He needs a home with a securely fenced yard, or a country farm or ranch. If you are considering an Australian Cattle Dog, make sure you can provide him a proper outlet for his natural energy and bright mind. Because he was bred to herd and chase, that's exactly what he will do: herd and chase just about anything, including cars. If you're not a sheep or cattle farmer, consider canine sports. This dog loves the activity and challenges associated with sports. The Australian Cattle Dog needs early socialization and training. Like any dog, he can become timid if he's not properly socialized when young. Early socialization helps ensure that your Australian Cattle Dog grows up to be a well-rounded dog. His propensity to mouth, chew, nip, and bite must be handled carefully. He must be taught not to put his mouth on people, only on appropriate chew items, such as sturdy toys. Keep your Australian Cattle Dog in good shape by measuring his food and feeding him twice a day rather than leaving food out all the time. If you're unsure whether he's overweight, give him the eye test and the hands-on test. First, look down at him. You should be able to see a waist. Then place your hands on his back, thumbs along the spine, with the fingers spread downward. You should be able to feel but not see his ribs without having to press hard. If you can't, he needs less food and more exercise. For more on feeding your Australian Cattle Dog, see our guidelines for buying the right food, feeding your puppy, and feeding your adult dog. The Australian Cattle Dog's weather-resistant outer coat is short and straight; he has a dense undercoat. The typical Australian Cattle Dog doesn't shed year-round, but instead he "blows" his coat once or twice a year (think of a snowstorm). In just a few weeks, the undercoat sheds in clumps. The Australian Cattle Dog's coloring is blue or red speckle. Blue or blue-mottled includes black, blue, or tan markings on the head; partially tan on the forelegs, chest, and throat; and tan on the jaw and hind legs. Sometimes the undercoat is tan with a blue outer coat. Red speckle means red all over, including the undercoat, and sometimes including dark red markings on the head. The Australian Cattle Dog doesn't require much primping, but some grooming is necessary to keep him clean and healthy. Brush him periodically, say four times a month, to distribute oils and remove dirt. When he sheds, though, brush frequently to remove the dead hair. Bathe him as needed — basically when he's really dirty or smells bad. Brush your Australian Cattle Dog's teeth at least two or three times a week to remove tartar buildup and the bacteria that lurk inside it. Daily brushing is even better if you want to prevent gum disease and bad breath. Trim nails once a month if your dog doesn't wear them down naturally. If you can hear them clicking on the floor, they're too long. Short, neatly trimmed nails keep the feet in good condition. Dog toenails have blood vessels in them, and if you cut too far you can cause bleeding — and your dog may not cooperate the next time he sees the nail clippers come out. So, if you're not experienced trimming dog nails, ask a vet or groomer for pointers. Begin accustoming your Australian Cattle Dog to being brushed and examined when he's a puppy. Handle his paws frequently — dogs are touchy about their feet — and look inside his mouth. Make grooming a positive experience filled with praise and rewards, and you'll lay the groundwork for easy veterinary exams and other handling when he's an adult. Australian Cattle Dogs are often purchased without any clear understanding of what goes into owning one. There are many Australian Cattle Dogs in need of adoption and or fostering. There are a number of rescues that we have not listed. If you don't see a rescue listed for your area, contact the national breed club or a local breed club and they can point you toward a Australian Cattle Dog rescue. Below are breed clubs, organizations, and associations where you can find additional information about the Australian Cattle Dog.